Dewey Dell (hive 2) Is Queenright! When my first hive made it through the winter full of bees, I knew they would want to swarm and decided to do a split. I was very anxious about the whole process because many variables could cause the resulting hive to fail. After all, they would have to raise a new queen and wait at least 30 days for her to hatch, mate, and start laying eggs. In the foraging season, workers only live up to six weeks, so there is little time for error. I have been checking the second hive every week to monitor their process, and last I was able to verify that queen was laying successfully, so the hive is ready for the season. 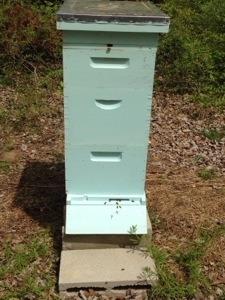 The hive is named after Addie’s only daughter, Dewey Dell, in As I Lay Dying.